The humble stapler is not an object to which much thought is often given. We likely only notice the stapler when it provides an unsatisfying experience—flimsy in the hand, doesn’t staple through to that last page, is awkward to open and replace the staples, or whose design is otherwise a reminder of the banality of office equipment. In the hands of designer Henning Andreasen, the humble stapler is an icon of beautiful, functional design. Introduced in 1977, the Folle 26 stapler, manufactured by Danish manufacturer Folle, is still in production today—a testament to its timeless appeal and functionality. (In fact, the Product Design and Decorative Arts department here at the Museum has one in its office for daily use.) With its design, Andreasen most certainly perfected the art of knowing when to stop. Made of steel and enamel, the Folle 26 stapler has a satisfyingly significant weight, lending to its durability and sturdiness. 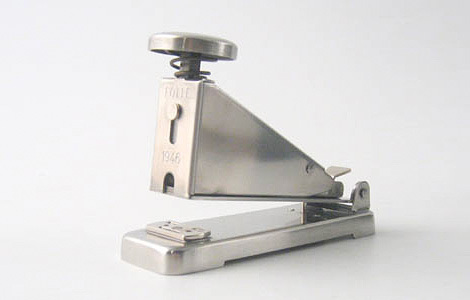 Its simple rectangular form terminates at a circular head, perhaps a nod to Folle’s classic stapler introduced in 1946, with its polished steel button that clearly and delicately suggests the user can operate the stapler with the press of a single finger. Folle Classic stapler. Designed by Folmer Christensen. 1946. Image from http://www.iainclaridge.co.uk/blog/780. Yet the Folle 26 has a more compact design, indicating it is intended to be picked up by the hand, which its uniform body and enameled arms easily accommodate. A button along the body is pressed to open the stapler, and the stapling action is a simple, downward action. In Andreasen’s hands, the stapler does not need to be anything more, or less. He stopped designing at precisely the right moment.